Contact Avancept for information about obtaining site licenses for our reports. A corporate site license is the easiest way to share the report with outside legal counsel. Little information has been revealed about the buyers of publicly auctioned patents. While the auctioned patents have been analyzed, and the sellers reasonably scrutinized, the buyers have remained somewhat of a mystery. 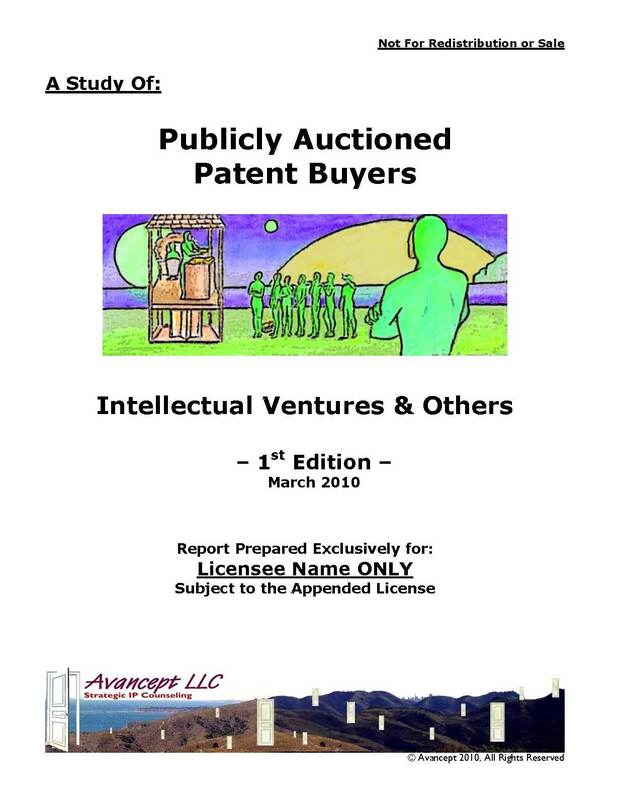 Our report fills that void by providing information about the buyers, both individually and as a group, of some 300 patent lots offered at nine Ocean Tomo patent auctions from Spring 2006-Spring 2009. 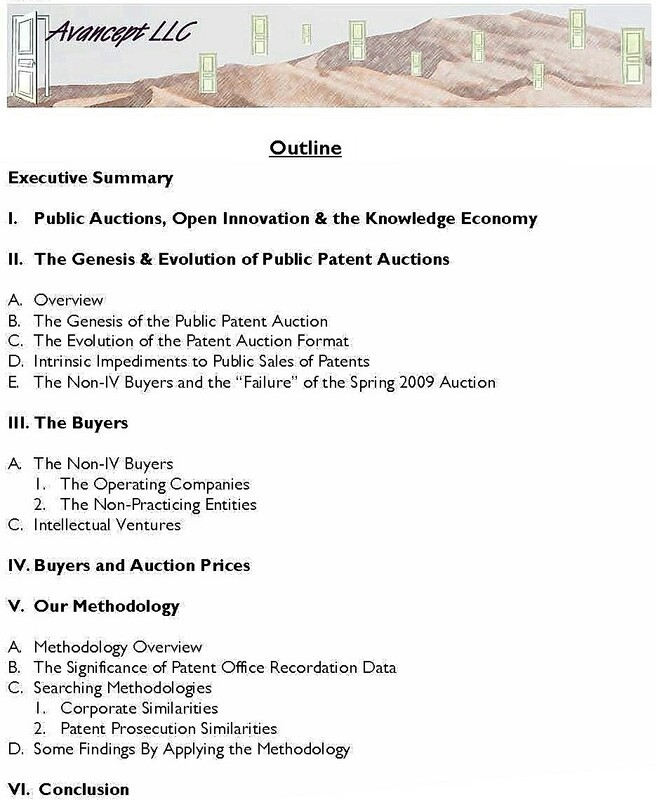 This 225-page report also describes the evolving nature of public patent auctions and what their success says about open innovation in the knowledge economy. By categorizing the buyers into various groupings, we are able to provide increased granularity with respect to purchase prices at these professionally conducted auctions than appears to have been previously reported. Intellectual Ventures paid more than $60 million for the lots having published pricing data, with the non-IV buyers paying some $20 million for those lots having published pricing data. Our research indicates that the operating company buyers, while few in number, tend to have paid the most per lot. Our research confirms the rumors that Intellectual Ventures purchased the lion’s share of patents sold at the Ocean Tomo auctions. We found that IV appears to have purchased some 76% of the lots sold, with the remaining 24% split about equally between other non-practicing entities and operating companies. In a broader context, we also examine the role of patent auctions in the knowledge economy and what the “success” of these auctions says about open innovation business strategies. The research provided here should be of interest not only to IP practitioners but also to legal and economic researchers as well. Our research also debunks the common myth that IV acquired most of its patents via auctions, as we find that the patents acquired likely amount to no more than 7% of the Bellevue-based company’s total portfolio. The report further debunks the often repeated rumor that Intellectual Ventures spends no more than $40,000 per patent. This publication marks the first of our executive series based upon data enhanced from our “The Intellectual Ventures Portfolio In the United States: Patents & Applications (2nd Edition, 2010).” This report has recently been mentioned in both the New York Times and Dow Jones Newswires. Our research here adds new patent shells and additional patents to those identified in our ground-breaking report.